This book was sent to me by Mira Ink publishers to read and review ready for it's release this week, and was honestly a struggle at times for me to read. The book was very slow to start making reading a task more than a pleasure. The first half of the book felt like it wasn't important to the plot line and although it did become clear at the end that it was important, it felt like Skuse was dragging things out making me as a reader wonder when she was going to get to the point. The plot picked up pace and action about half way through the book but didn't become a heart racing thrilling read until the last three chapters which was disappointing. The book is classed under the genre YA fiction, however has elements of non-fiction mixed in, shown through the mention of real places, celebrities, social networking and references such as mobile phones, computers, etc... and is set in today's society. However this did make the plot relatable and easy to follow as I was familiar with the references being made. It is written in the third person narrative following the main protagonist, Nash. I felt that the narrative worked very well as I was experiencing everything though the eyes of Nash, allowing me to feel and understand what she was feeling and going through. It also allowed me to engage with the plot on a personal level as I felt like I was experiencing it all myself. Personally I felt that there was too much dialogue and a lot of it could have been rewritten as description which would have made it more easier to read. The book is set in todays society at an old boarding school for girls out in a small desolate fictional village Bathory, England. 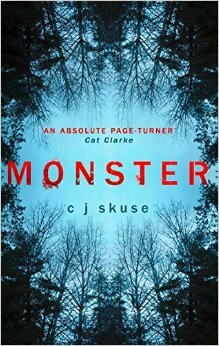 I felt that the setting was perfect for the plot line and really added to the suspense and drama Skuse created through her writing. Her description of the setting was detailed allowing me to visualize what was going on in my head which I loved. The plot line itself is very similar to the Cornish legend, the beast of bodmin moore, which C J Skuse herself confirmed to me over twitter. I love the beast of bodmin moore legend so for me the similarities really drew me in and fascinated me, helped me get into the book. Unfortunately Monster wasn't a book I fell in love with because it was so slow paced to start with and to use of too much dialogue, but the basic plot line is interesting enough that i would say give it a go.